Cristiano Ronaldo on Sunday gave a display of pure star power in his debut for Italian champions Juventus, showing his class on and off the pitch at the club’s traditional alpine curtain raiser. Nearly 5,000 fans crammed into the compact “Gaetano Scirea” stadium in Villar Perosa at the foot of the Italian Alps, as supporters descended on the small town in order to catch a glimpse of the superstar attacker in his first appearance since signing for 100 million euros ($117 million) a month ago. 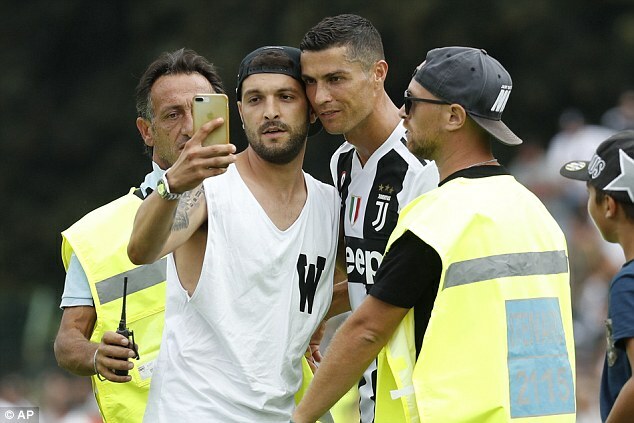 They were rewarded with a goal in the friendly between Juve’s first XI and a youth “B” team from their new hero, who also took the time out to sign autographs and pose for selfies while many of his teammates sloped off to the dressing room. Chants of “Ronaldo, bring us the Champions (League)” filled the air as supporters worked their way through a locked-down mountain town in which 600 police officers were called to a place with a population of just over 4,000 and road blocks stopped anyone entering without a match ticket or proof of residence. The town’s bars and restaurants were heaving with fans and media hours before the match’s 1700 (1500 GMT kick off), with fans in replica kits wrapped in scarves and flags arriving to see the five-times Ballon d’Or winner take part in one of Italian football’s most curious traditions. Villar Perosa is the fiefdom of the powerful Agnelli family, the founders of Fiat and the clout behind Juve, who bought their family estate there — nicknamed “The Castle” — in the mid-19th century and established the annual pre-season friendly in the town. Cesare Bertoncello, from Turin, who was pointed out to AFP by security as being the first person to arrive in the queue to get into the ground at 0900 (0700 GMT) recalled the dominating presence of the Agnellis in years passed. It was Ronaldo’s prowess in Europe that caused Juventus to splash a club record fee, as they look to put two lost finals in the last four years behind them and try for European glory for the first time since 1996. The chants of “Cristiano, Cristiano” had barely died down when the five-times Ballon d’Or winner provoked Juve’s second by forcing the unfortunate youth team defender Riccardo Cappellini to poke past his own goalkeeper three minutes later. The 33-year-old proved too much for Juve’s youth players, laying on winger Douglas Costa for a shot that crashed off the post and creating the first of Paulo Dybala’s brace thanks to a shot that was well saved by young stopper Leonardo Loria. Come the half-time whistle, Ronaldo shot off the pitch — followed by one ambitious fan who had to be held off by security after dashing towards and trying to hug his new hero — and towards delirous fans waiting near the dressing rooms, for whom he patiently signed autographs and posed for selfies. However he didn’t come out for the second-half of the match, which was eventually won 5-0 by the first XI and came to an end with around 20 minutes left when supporters piled onto the pitch and got a piece of their heroes. 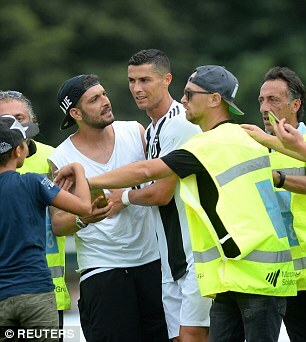 Fans tried to get whatever autographs and photos they could — even stripping returning centre-back Leonardo Bonucci down to his underwear — before Ronaldo emerged from the changing room surrounded by security guards and fans surged towards the barrier separating them from the players. Ronaldo once again stopped and signed more autographs than any of his teammates, while security desperately tried to stop young fans from being crushed in the surge before their leading man left for the team bus, accompanied by wild applause.